Aerfer was an Italian manufacturing company created in 1955 by the merger of IMAM and Meridionali. The name is a contraction of Costruzioni Aeronautiche e Fer roviarie (Aeronautical and Railway Constructors). 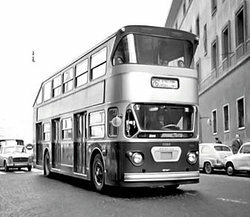 Based in Naples, Italy, mainly an aeroplane builder, also built a range of lightweight buses between about 1952 and 1965. The largest and most impressive of those were a series of three-door double deckers for Florence (Firenze) built during the beginning of the 1960's. They had a capacity of 100 persons and a rear-mounted 150 horse power Fiat engine. In 1969 it combined with Salmoiraghi and the aviation division of Fiat to create Aeritalia. The firm is remembered mostly in connection with the development of Italy's first supersonic jet, the Aerfer Sagittario 2. Aerfer Sagittario 2--(1956) All-metal development of Sagittario. Broke sound barrier.